A talk to the residents of Chignal House, Rayleigh resulted in an amazing fundraising total of £500. 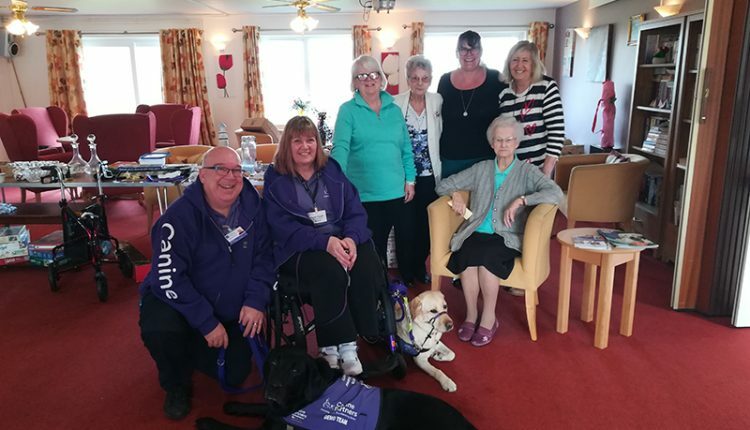 On Wednesday 7 March Team Flower, made up of partnership Steph and Wisteria as well as demo dog handler John and his demo dog Merlin, visited the residents at Chignal House in Rayleigh, Essex to deliver a talk and demonstration of the amazing things our dogs can do to support people like Steph. Steph has a degenerative condition which requires her to use a wheelchair. The talk began with some anecdotes from Steph and John, sharing how assistance dogs have had a significantly positive impact on their lives – from Steph’s first canine partner Frodo, her first successor dog Elmo and her current canine partner Wisteria. Next up, Merlin an John went through the basic tasks a canine partner will learn – touch, tug and retrieve. Merlin also demonstrated how a canine partner can push buttons, pull light switches and pick up dropped items such as keys or a wallet. He then wowed the crowd by taking off John’s gloves, unzipping and removing his jacket as well as undoing his shoelaces and taking his shoes and socks off. As is Merlin’s usual style, he finished it all with a bow! After the talk and demo, the team stuck around to do a meet and greet, answer any questions and support the table sale taking place to fundraise for us. The audience was made up of residents from Chignal House whom were joined by Chris Silver, the Neighbourhood Partnership Manager of Sanctuary Housing who look after the residential block, along with a few of the regional staff as well. Everyone was really impressed with the demonstration and the work that we do to support people with disabilities. Following on from the talk and demonstration, the residents were able to raise an incredible total of £500 from a raffle and the table sale. An amazing figure for such a small group! Special thanks goes to Patricia Davies who was responsible for organising the fantastic fundraising. Our network of amazing volunteer speakers deliver talks and demonstrations across England and Scotland. Find out more and book a talk for your group here.